This summer’s record-breaking temperatures are putting air conditioning systems to the test on construction equipment everywhere. Excessive heat contributes to operator fatigue, which can result in lost productivity and create potentia l hazards on the job site, so it’s important to make sure your heavy equipment’s air conditioning systems are in peak working order. A poorly performing air conditioning system puts additional load on the machine’s engine, which means higher fuel consumption. Even a slow freon leak affects cooling performance, and the loss of lubricant can lead to system contamination or premature air conditioner failure. A freon recharge, in the short run, will keep your construction equipment’s A/C going, but it will not solve the root cause of the problem. Ring Power services air conditioning systems on most construction and heavy equipment, including excavators, landfill compactors, backhoe loaders, motor graders, wheel scrapers, front-end loaders and track-type tractors. 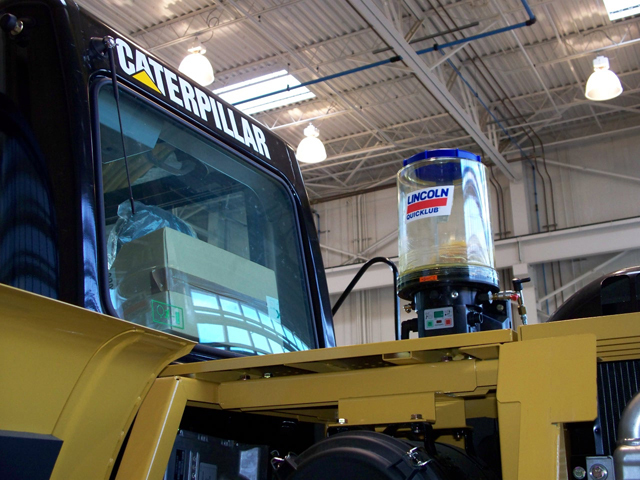 We also service popular brands like Caterpillar, John Deere, Komatsu, Hitachi, Volvo and Case. Call or email us to schedule air conditioning service for your heavy equipment. 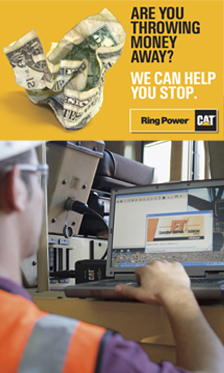 Ring Power Corporation, North and Central Florida's Caterpillar dealer, is headquartered in St. Augustine, Florida, with branch locations in Brooksville, Daytona, Gainesville, Jacksonville, Lake City, Lakeland, Ocala, Orlando, Palm Bay, Perry, Sarasota, Tallahassee, Tampa and Tarpon Springs. We welcome your comments about this article. Click on the title to leave a suggestion or ask a question. Ring Power's St. Augustine branch donated the heavy equipment paint shop's expertise to the Rodeheaver Boys Ranch by offering to restore the charitable organization’s Ford C-Series fire truck. The ranch, which is located in Palatka, Fla., utilizes the fire truck for small brush fires, Boy Scout merit badge training, and to train boys for future public service careers. The truck had been eaten away by rust, leaving holes in the roof and body. A special thanks to the whole St. Augustine paint shop crew for making the truck look as good as the day it rolled off the assembly line! Ring Power offers a wide array of training courses including, but not limited to: Hydraulics, Electrical, Engine, Safety and many other training courses tailored to your needs! If you have Caterpillar® Service Information System (SIS) or Electronic Technician (E/T) but are not using the software, or not using it properly, you are throwing money away! Let Ring Power’s Training Department help teach your heavy equipment technicians how to use these diesel engine analysis programs to get the most out of your construction equipment investment; because well-trained technicians will save you valuable equipment downtime and, in turn, save your company money. Ring Power offers you the highest quality of heavy equipment, diesel engine, hydraulics and electronic training in the construction and power generation industry. We accomplish this through the experience, commitment and qualifications of our Master Trainers, which include both State and Federal Certifications. We offer a wide array of training courses including, but not limited to: hydraulics, electrical, diesel engine, operator safety and many other training courses tailored to your needs! 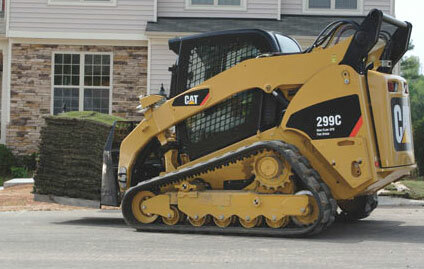 Ring Power's training programs are designed specifically for your heavy equipment and applications. Your organization’s needs are determined by reviewing where you are and where you want or need to be. The training professional then sets about designing a definitive training program to assist in the achievement of your department’s service technician training goals. Ring Power Truck Shops Gear Up for More than Engines! 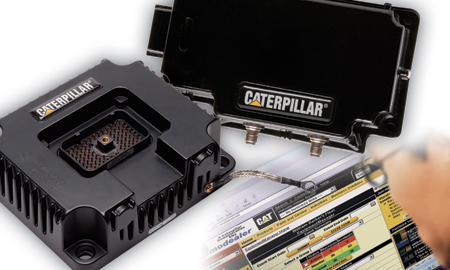 When Caterpillar announced last year that it would not supply EPA 2010-compliant engines to truck or other on-highway original equipment manufacturers (OEMs) in the U.S., Ring Power made a bold business decision: to expand truck shop services to include a complete menu of rountine truck services for all brands of on-highway trucks and components—and not just Cat engines. 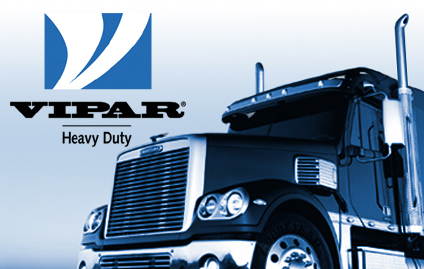 In January, Ring Power became a stockholder in VIPAR Heavy Duty Inc., an exclusive and prestigious on-highway truck parts network that leverages the combined purchasing power of its members to assure long-term profitability, enhance vendor brand equity and increase combined market share. Miller, whose background includes more than 18 years in on-highway truck parts and service, sees this as an important step toward Ring Power’s success in the business. "Being a VIPAR member gives us access to on-highway truck parts suppliers that we might not have been able to do business with on our own," Miller said. Ring Power parts department managers and parts associates from St. Augustine to Tampa have actively embraced VIPAR network training. On-highway Truck technician training sessions, which began in February, will be held as often as necessary to keep Ring Power diesel truck shop technicians up to speed on all makes of on-highway diesel truck engines and components. With 95 on-highway truck service bays and 73 truck shop diesel technicians at 12 full-service on-highway truck shop locations, Ring Power is poised to take a commanding lead in a viable Florida market. Full service facilities located in Jacksonville, St Augustine, Lake City, Orlando, Ocala, Palm Bay, and Tampa. Because compact track loaders (CTL) have different undercarriage than skid steer and multi-terrain loaders, an overview of suggested maintenance for Cat® CTL undercarriage will be helpful. The Cat-designed and -built undercarriage uses heavy-duty torsion axles for completely independent movement. This gives you smooth travel, better load retention and greater productivity, and allows work in soft underfoot conditions. Steel embeds span the track width to provide durability while continuously wound cables hold the embeds in place and ensure the track does not stretch. Use a recoil grease tensioner to maintain proper track tension. Clean the undercarriage at least once daily, especially between the roller and idler wheels and around the sprocket. It is easier to remove materials like mud at the end of a shift rather than later when it has dried. The front and rear torsion axles require daily greasing. Make gradual three-point turns to avoid unnecessary wear. Use counter-rotations only when necessary; for example, in confined areas. Working up and down slopes reduces the side-loading wear that occurs when you work across a slope. Keep the heaviest end of the machine uphill. Approach transitions (for example, going over a curb) at a 90° angle. Avoid work where a track is not fully supported by the ground. When back dragging, keep the full length of the track on the ground and the loader arms in the float position. Contact your Ring Power Representative to discuss your Cat CTL or other undercarriage needs or email us for more information. Ring Power’s extensive equipment maintenance experience has shown that contamination control equals quality control. Advanced Maintenance Solutions enhances the customer’s ability to control and monitor both. 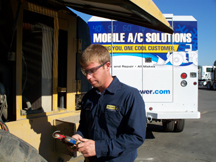 To help customers reduce contamination and other problems associated with poor maintenance, Ring Power is bringing Advanced Maintenance Solutions to machines on the jobsite with a fleet of mobile service vehicles, staffed by trained technicians and fully equipped to handle any repair or installation associated with these new services. Used individually, each of these service options offers benefits that can help streamline preventive maintenance and reduce owning and operating costs. Used in combination, these services create a new level of automatic machine maintenance and monitoring, simplifying routine preventive maintenance and extending machine life. The daily lubrication of a machine can be difficult due to a number of variables ranging from weather to production demands. Improper lubrication of bearings can lead to contamination, which wears down the components, resulting in downtime and expenditures for replacement parts or wasted grease from over-lubricating. Lincoln Quicklubautomatically lubricates the external points of the machine. Through Lincoln’s unique system, small, measured amounts of grease are automatically delivered to each bearing at specific time intervals while equipment is operating. This method produces a grease seal around each pin and bushing, creating a barrier to keep contaminants out while ensuring the machine is never over-lubricated. In fact, the system uses less grease than it takes to manually lubricate a machine with a grease gun. Quicklub combines a pump with an adjustable integrated controller, lubricant measuring valve, supply/feed line hoses and connection fittings. When triggered by the timer, the pump starts to dispense lubricant to the primary divider valve, which then distributes the lubricant to the secondary valves. The secondary valves dispense the correct amount of lubricant to each lubrication point. The system can be set to run for a preset time or to shut off after receiving a signal from a proximity switch. Protection from the Start. Lubrication is the lifeblood of diesel engines, especially for today’s high-performance, fast-starting models. The QuickEvac system delivers up to 40 gallons of oil per minute, eliminating dry-start wear by ensuring full oil pressure from turbo to crankshaft. Every time the engine starts, QuickEvac prelubricates the complete engine and all oil passages automatically, safely and rapidly before cranking can begin. Contamination Control. Tighter tolerances, higher pressures and computerized controls on today’s high-performance diesel engines demand cleaner fluids for optimal performance and life. Even small improvements in contamination control are yielding big results in engine and component life. The QuickEvac system automatically filters new oil, before it enters the engine. It also pre-fills new oil filters automatically, safely and correctly, eliminating the need to fill them by hand. Environmentally Friendly. Tougher environmental regulations and heavy fines demand greater care in handling, transferring and properly disposing of oil. QuickEvac offers foolproof, spill-proof protection. Leak-free quick couplers with direct draining to final containment eliminate leaks and spills, keeping service technicians, the workplace and the environment cleaner and safer. With Product Link you can gather information about your machines from any place at any time. This allows you to optimize asset utilization, reduce security risk, and improve maintenance management. Product Link comes in two different models. The first is the PL121SR, which provides GPS location and operating hours. It is also capable of automatically alerting you when machines operate beyond owner-identified time or location limits. The second model, or PL321SR, tracks GPS location and operating hours just like the first model, plus it can provide machine health information (to troubleshoot repair issues before they become a problem), indicate fuel level and consumption, and provide condition-based event data, diagnostic reports, and/or alerts. Equipment owners and operators who take advantage of Ring Power’s Advanced Maintenance Solutions can effectively eliminate downtime caused by lubrication-related component failures. In addition, you will gain productive time each day by eliminating shutdown for manual lubrication, and you will avoid costly repairs so your time can be better utilized. Even routine operations, such as changing buckets and attachments, are simplified because the couplings are well lubricated and easier to move. Get Gear for the New Year! Ring Power can now supply new, high quality, replacement rubber tracks for every make and model machine (such as Takeuchi and Bobcat) at an incredible savings over the OEM list price! Most popular machine brands rubber tracks are in stock for immediate delivery. Call Ring Power's undercarriage specialist today at 1-800-671-0025 for details. Weiler E1250 Material Transfer Vehicle makes for smooth paving. Ring Power recently added three Weiler machines to its ever-expanding family of industry-leading products for customers in the specialized field of asphalt paving: the E1250 Material Transfer Vehicle and two Road Wideners, the W530 and the W730. Weiler, a division of Five Star Industries of Knoxville, Iowa, has a long history of manufacturing quality products for some of the most well respected companies in the U.S., including the former Barber-Green line of road wideners and windrow elevators. The Weiler E1250 incorporates the latest technology to address a couple of common problems for paving contractors. Essentially, the wheeled conveyor system separates the haul truck from the asphalt paver to ensure smooth delivery while constantly blending the asphalt mix to reduce material and thermal segregation. This not only improves the smoothness and ride quality of the asphalt mat, but also increases the longevity and durability of the road surface. This attention to recommendations is first noticeable from sitting down at the controls. The operator’s station can be repositioned to either side of the machine and steering can be adjusted with a standard tilt wheel. Common functions are more conveniently located for ease of use and a manual push-button override allows the operator to run the elevator at maximum capacity without changing the preset running speed. The machine features a 250-h.p C7 Cat® Tier III engine, with 100-gallon hydraulic tank capacity. The four-wheel, two-speed, Caterpillar® planetary drive system maximizes pushing power while allowing for a tighter turning radius and lower center of gravity. The elevator is direct-driven with two high-torque, hydraulic motors; the conveyor is driven with one. There are no gearbox seals, bearings, or fluids required, thereby reducing the number of wear parts and increasing reliability. 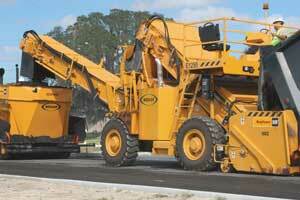 An optional, power-remix, transition hopper insert for the paver gives the operator more surge capacity. Twin interlaced augers remix and narrow the material entering the conveyor, and a drop-through cover forces all of the material to be mixed by the auger flight. The E1250 offers a great example of how a quality product can be created through a combination of reliable components and an ear to operator comments. In fact, Weiler has sought out the valuable input from end-users for their entire line of machines. The 730 Road Widener was the first product offered under the Weiler name; a model that, six months after introduction was given new options based upon operator feedback. At the same time as Weiler expanded the options of the 730, they also introduced the 530 road widener. The 530 is a smaller, more economical version of the 730, created in response to high percentage of widening jobs being six feet or less. The larger of the two self-propelled road wideners, the W730 features a 174-h.p., Cat 3056E ATAAC engine, and is capable of widening from one to 12 feet with a working depth of 12 inches above and below grade. With the optional long conveyor and weight kit, it can widen roads up to 14 feet. The four-wheel, two-speed, two gearbox, hydraulic drive (with three steering modes) offers greater control. The rear-wheel steering axle has a manual override to allow for a fourth steering mode for minor corrections while operating. Other features include the remotely located oil cooler, standard oscillating push rollers, and optional cab to protect the operator from the elements.